It seems that a few days ago I looked at my calendar and September was just ending. How is it almost December? The one thing I systematically look forward to at this time of year is waiting for the first real snow fall. You know, that moment when the skies become white and fluffy, the city quiets down, and thick cotton-like fluffs fall from above in calming streaks? I might not love it as much come February, or March.. or April! but in December it has to be one of the most beautiful scenes nature has to offer. The first snow fall hasn't hit Toronto yet, but we've been hard at work preparing for the holidays at the Style at Home offices! Whether you're celebrating Christmas, Hanukkah or just time off with friends and family, this time of year usually comes with wrapping a few gifts. 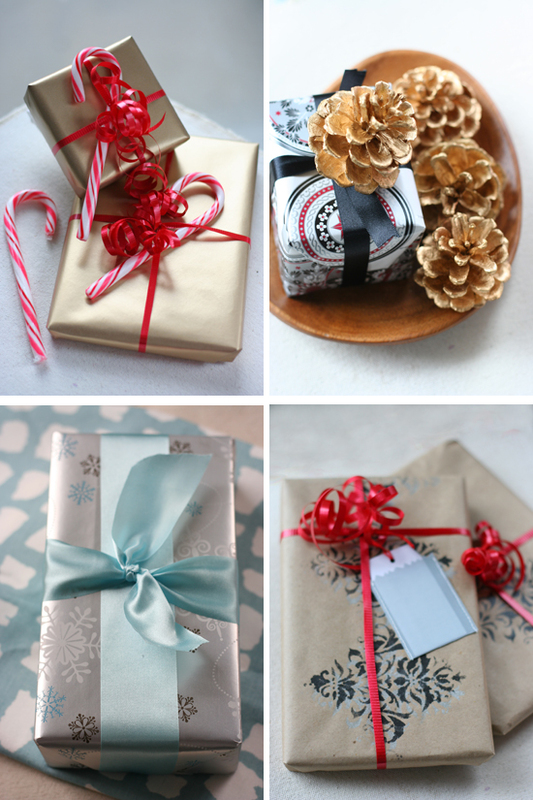 I've prepared a few easy ideas to spice up your wrapping skills this year. What do you think? These are all you need to make something personal and pretty without spending a bundle. To read more about these, take a look at my complete article here. Nice wrapping, I can't wait for the Holidays. The gift wrapping ideas come in handy :) I have some cookies to send for a cookie swap, and I'm still debating on how to decorate the packaging! Claudie: Let me know which one you end up deciding on! Zee: It's definitely difficult not to feel a tad special when you receive a nicely wrapped present isn't it? Beautiful! I love your ideas. Those golden pine cones are gorgeous! Fantástico! Há tempos procuro por trabalhos com esta qualidade. No Brazil ainda não temos algo deste nível. Congratulations! Copyright © Jennifer Bartoli 2007-2013, unless otherwise stated. All rights reserved.